Charles was the son of Charles and Alice Maud Raynes, his father passing away in 1903. His mother married Samuel Taylor at Walsall in 1912 later residing at 79, South Street, Walsall. 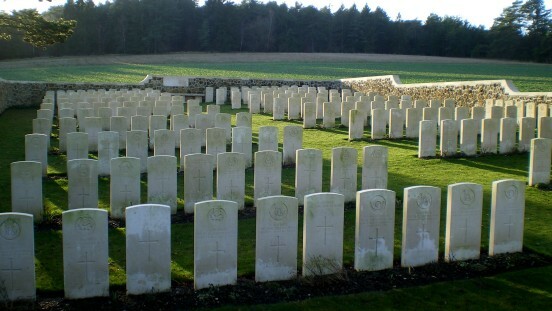 Drafted to France on Friday 18/01/1918, Charles was killed in the fighting around the woods near Marfaux. On the day of his death his bn attacked through Bois de Rouvroy and the Bois d’Avermont against Bouilly Ridge. United Kingdom Private 202257York and Lancaster Regiment23/07/1918 I. G. 10. United Kingdom Private 267409Duke of Wellington's (West Riding Regiment)20/07/1918 Age: 21 II. C. 5. United Kingdom Private 35715Yorkshire Regiment12/06/1918 Age: 19 II. E. 9. United Kingdom Lance Corporal 202263King's Own Yorkshire Light Infantry21/07/1918 Age: 23 I. H. 7. United Kingdom Private 32857York and Lancaster Regiment20/07/1918 Age: 36 I. B. 1. United Kingdom Private 201662York and Lancaster Regiment23/07/1918 II. D. 3. United Kingdom Private 47657King's Own Yorkshire Light Infantry20/07/1918 II. J. 8. United Kingdom Rifleman 63774West Yorkshire Regiment (Prince of Wales's Own)28/07/1918 Age: 18 II. G. 10. United Kingdom Private 62487King's Own Yorkshire Light Infantry20/07/1918 Age: 18 I. I. 3. United Kingdom Corporal 325389Durham Light Infantry21/07/1918 Age: 22 II. J. 3. United Kingdom Private 26821York and Lancaster Regiment21/07/1918 Age: 23 I. F. 8. United Kingdom Lance Corporal 12/1292York and Lancaster Regiment23/07/1918 Age: 19 Sp. Mem. 6. United Kingdom Private 241549Gordon Highlanders28/07/1918 Age: 32 II. F. 4. United Kingdom Private 18075King's Own Yorkshire Light Infantry20/07/1918 I. J. 8. United Kingdom Private 37016King's Own Yorkshire Light Infantry20/07/1918 II. J. 6. United Kingdom Lance Corporal 28530York and Lancaster Regiment21/07/1918 Age: 36 I. E. 10. United Kingdom Private 35817Wiltshire Regiment31/05/1918 Age: 18 II. E. 5. United Kingdom Private 201315Yorkshire Regiment12/06/1918 II. E. 10. United Kingdom Lance Corporal 241875Duke of Wellington's (West Riding Regiment)20/07/1918 Age: 39 II. D. 7. United Kingdom Private 276349Argyll and Sutherland Highlanders30/07/1918 II. F. 10. United Kingdom Private 200274King's Own Yorkshire Light Infantry20/07/1918 I. E. 1. United Kingdom Private 325528Durham Light Infantry23/07/1918 II. B. 2. United Kingdom Private 18081King's Own Yorkshire Light Infantry20/07/1918 I. J. 9. United Kingdom Private 241295Duke of Wellington's (West Riding Regiment)20/07/1918 Age: 20 II. D. 10. United Kingdom Private 375522Durham Light Infantry23/07/1918 II. B. 1. United Kingdom Private 32864York and Lancaster Regiment20/07/1918 Age: 22 II. J. 1. United Kingdom Private 250229Durham Light Infantry23/07/1918 Age: 28 II. B. 10. United Kingdom Private 17227York and Lancaster Regiment20/07/1918 II. A. 4. United Kingdom Private 34946York and Lancaster Regiment20/07/1918 Age: 32 II. D. 5. United Kingdom Private 62514King's Own Yorkshire Light Infantry20/07/1918 I. J. 3. United Kingdom Private 201289King's Own Yorkshire Light Infantry20/07/1918 I. H. 8. United Kingdom Private 16378York and Lancaster Regiment21/07/1918 I. E. 6. United Kingdom Private 37763York and Lancaster Regiment21/07/1918 Age: 22 Sp. Mem. 4. United Kingdom Private 241132Devonshire Regiment28/07/1918 II. G. 9. United Kingdom Company Serjeant Major 201403York and Lancaster Regiment22/07/1918 Age: 33 I. E. 9. United Kingdom Private 202034King's Own Yorkshire Light Infantry20/07/1918 I. J. 10. United Kingdom Private 33632Duke of Wellington's (West Riding Regiment)20/07/1918 Age: 20 II. C. 2. United Kingdom Captain Wiltshire Regiment31/05/1918 Age: 29 II. F. 1. United Kingdom Private 41797York and Lancaster Regiment21/07/1918 I. G. 1. United Kingdom Private 205591King's Own Yorkshire Light Infantry20/07/1918 Age: 27 I. J. 1. United Kingdom Private 325316Durham Light Infantry23/07/1918 II. B. 7. United Kingdom Serjeant 325323Durham Light Infantry21/07/1918 Age: 29 Sp. Mem. 7. United Kingdom Private 41900York and Lancaster Regiment20/07/1918 Age: 29 II. A. 5. United Kingdom Private 23673York and Lancaster Regiment20/07/1918 II. I. 4. United Kingdom Private 92930Durham Light Infantry21/07/1918 I. H. 10. United Kingdom Rifleman 16/1569West Yorkshire Regiment (Prince of Wales's Own)28/07/1918 II. H. 8. United Kingdom Private 201946York and Lancaster Regiment20/07/1918 II. E. 4. United Kingdom Private 204260Duke of Wellington's (West Riding Regiment)20/07/1918 II. C. 6. United Kingdom Private 58124King's Own Yorkshire Light Infantry20/07/1918 I. H. 6. United Kingdom Rifleman 52370West Yorkshire Regiment (Prince of Wales's Own)28/07/1918 Age: 19 II. H. 4. United Kingdom Private 47486King's Own Yorkshire Light Infantry20/07/1918 Age: 29 I. G. 9. United Kingdom Corporal 300893Argyll and Sutherland Highlanders30/07/1918 II. F. 7. United Kingdom Private 62545King's Own Yorkshire Light Infantry20/07/1918 Age: 18 I. C. 10. United Kingdom Private 325436Durham Light Infantry23/07/1918 Age: 20 II. B. 6. United Kingdom Private 21595Duke of Wellington's (West Riding Regiment)20/07/1918 Age: 20 II. C. 3. United Kingdom Private 205369King's Own Yorkshire Light Infantry20/07/1918 Age: 37 I. I. 6. 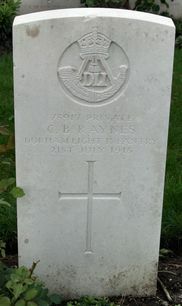 United Kingdom Private 205249Durham Light Infantry21/07/1918 Age: 34 II. J. 2. United Kingdom Private 203761East Yorkshire Regiment10/06/1918 II. E. 6. United Kingdom Private 25095Duke of Wellington's (West Riding Regiment)20/07/1918 Age: 24 II. C. 7. United Kingdom Private 276692Argyll and Sutherland Highlanders30/07/1918 II. G. 3. United Kingdom Private 23907Duke of Wellington's (West Riding Regiment)20/07/1918 II. D. 9. United Kingdom Driver 93796Royal Field Artillery05/06/1918 Age: 21 II. A. 9. United Kingdom Lance Corporal 277253Durham Light Infantry23/07/1918 Age: 29 II. B. 9. United Kingdom Private 202543York and Lancaster Regiment20/07/1918 Age: 24 I. B. 9. United Kingdom Private 48891North Staffordshire Regiment14/06/1918 II. H. 5. United Kingdom Private 250722Durham Light Infantry23/07/1918 II. B. 5. United Kingdom Private 265664Gordon Highlanders27/07/1918 II. F. 3. United Kingdom Private S/16795Argyll and Sutherland Highlanders30/07/1918 II. G. 4. United Kingdom Private 241180Duke of Wellington's (West Riding Regiment)20/07/1918 II. D. 4. United Kingdom Private S/23173Argyll and Sutherland Highlanders30/07/1918 II. G. 8. United Kingdom Private 251116Durham Light Infantry21/07/1918 Age: 36 I. I. 5. United Kingdom Serjeant 9755West Yorkshire Regiment (Prince of Wales's Own)28/07/1918 II. F. 8. United Kingdom Private 92951Durham Light Infantry21/07/1918 Age: 19 II. I. 6. United Kingdom Private 55149North Staffordshire Regiment03/06/1918 Age: 19 II. H. 6. United Kingdom Private 241559Duke of Wellington's (West Riding Regiment)20/07/1918 Age: 21 II. D. 8. United Kingdom Corporal 325262Durham Light Infantry21/07/1918 II. I. 5. United Kingdom Private 201445King's Own Yorkshire Light Infantry20/07/1918 II. A. 1. United Kingdom Lance Corporal 18032York and Lancaster Regiment21/07/1918 Age: 22 Sp. Mem. 1. United Kingdom Private 49815Durham Light Infantry23/07/1918 II. C. 1. United Kingdom Corporal 200707King's Own Yorkshire Light Infantry20/07/1918 I. H. 9. United Kingdom Private 34108King's Own Yorkshire Light Infantry20/07/1918 Age: 31 I. D. 4. United Kingdom Private 78950Durham Light Infantry23/07/1918 Age: 19 II. B. 4. United Kingdom Second Lieutenant King's Own Yorkshire Light Infantry20/07/1918 I. A. 4. United Kingdom Private 78917Durham Light Infantry21/07/1918 I. I. 2. United Kingdom Private 202670York and Lancaster Regiment21/07/1918 Age: 31 I. E. 8. United Kingdom Private 46603King's Own Yorkshire Light Infantry20/07/1918 Age: 19 I. J. 2. United Kingdom Serjeant 240961King's Own Yorkshire Light Infantry21/07/1918 I. I. 7. United Kingdom Second Lieutenant York and Lancaster Regiment20/07/1918 Age: 23 I. G. 4. United Kingdom Private 47698King's Own Yorkshire Light Infantry20/07/1918 Age: 25 II. A. 2. United Kingdom Private 47775King's Own Yorkshire Light Infantry21/07/1918 I. I. 1. United Kingdom Private 59577Durham Light Infantry21/07/1918 Age: 18 I. A. 10. United Kingdom Private 201489York and Lancaster Regiment24/07/1918 I. B. 10. United Kingdom Private 276461Argyll and Sutherland Highlanders30/07/1918 II. G. 5. United Kingdom Private 241208Duke of Wellington's (West Riding Regiment)20/07/1918 II. C. 4. United Kingdom Captain King's Own Yorkshire Light Infantry20/07/1918 Age: 39 I. A. 1. United Kingdom Serjeant 202532York and Lancaster Regiment20/07/1918 Age: 27 I. D. 8. 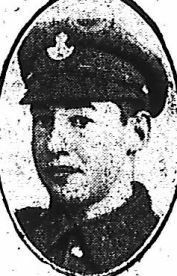 United Kingdom Lance Corporal 42399West Yorkshire Regiment (Prince of Wales's Own)20/07/1918 Age: 20 II. D. 2. United Kingdom Private 39245King's Own Yorkshire Light Infantry20/07/1918 Age: 19 I. C. 7. United Kingdom Private S/23692Argyll and Sutherland Highlanders30/07/1918 II. H. 1. United Kingdom Private 252554Durham Light Infantry21/07/1918 Age: 31 II. I. 10. United Kingdom Private 77733Durham Light Infantry21/07/1918 II. I. 7. United Kingdom Private 35872King's Shropshire Light Infantry07/06/1918 II. G. 2. United Kingdom Private S/17517Gordon Highlanders28/07/1918 II. F. 5. United Kingdom Private 62471King's Own Yorkshire Light Infantry20/07/1918 Age: 26 I. J. 4. United Kingdom Private 14/1553York and Lancaster Regiment20/07/1918 II. I. 9. United Kingdom Private 92984Durham Light Infantry23/07/1918 Age: 19 II. A. 10. United Kingdom Private 51927King's Own Yorkshire Light Infantry20/07/1918 I. I. 9. United Kingdom Private 47799King's Own Yorkshire Light Infantry20/07/1918 Age: 20 I. I. 10. United Kingdom Private 68153Devonshire Regiment28/07/1918 II. F. 2. United Kingdom Private 71555Machine Gun Corps (Infantry)20/07/1918 II. E. 3. United Kingdom Private 202547York and Lancaster Regiment21/07/1918 Sp. Mem. 5. United Kingdom Private S/21662Argyll and Sutherland Highlanders30/07/1918 II. G. 6. United Kingdom Private 240359King's Own Yorkshire Light Infantry20/07/1918 Age: 27 I. J. 7. United Kingdom Private 202379York and Lancaster Regiment20/07/1918 Age: 20 I. B. 5. United Kingdom Private 35271Yorkshire Regiment12/06/1918 Age: 19 II. E. 8. United Kingdom Private S/42370Gordon Highlanders28/07/1918 Age: 18 II. F. 6. United Kingdom Private S/40851Argyll and Sutherland Highlanders30/07/1918 II. H. 3. United Kingdom Private 17653Duke of Wellington's (West Riding Regiment)20/07/1918 II. C. 8. United Kingdom Private 278887Argyll and Sutherland Highlanders30/07/1918 II. G. 7. United Kingdom Corporal 205066Durham Light Infantry23/07/1918 Age: 20 II. B. 8. United Kingdom Private 26443King's Own Yorkshire Light Infantry20/07/1918 Age: 22 I. I. 4. United Kingdom Private 77875Durham Light Infantry21/07/1918 I. H. 5. United Kingdom Private 58104King's Own Yorkshire Light Infantry20/07/1918 I. J. 6. United Kingdom Lance Corporal 327220Durham Light Infantry23/07/1918 II. B. 3. United Kingdom Private 39259King's Own Yorkshire Light Infantry20/07/1918 Age: 19 I. J. 5. United Kingdom Lance Corporal 70778Durham Light Infantry22/07/1918 II. A. 3. United Kingdom Private 22250York and Lancaster Regiment20/07/1918 Age: 29 Sp. Mem. 2. United Kingdom Private 202722York and Lancaster Regiment21/07/1918 Age: 34 Sp. Mem. 3. United Kingdom Lance Corporal 9135Machine Gun Corps (Infantry)20/07/1918 Age: 25 II. E. 2. United Kingdom Private S/18250Argyll and Sutherland Highlanders30/07/1918 II. H. 2.